The gulf between facts and bias always looms large when dealing with the great apes. Gorillas have bedeviled the human imagination since they debuted on the world stage in the 19th century, eventually spawning movies like King Kong and Mighty Joe Young that emphasized their chest-beating fearsomeness. Yet they are gentle giant herbivores who are mostly pacific (with, by the way, some of the smallest penises in the animal kingdom). By contrast chimpanzees have been consistently cast as clowns (Bonzo, Cheetah, Bubbles), even though they are in reality omnivores who war, eat flesh and kill. Now new research featured in an article in the NY Times gives us something new under the sun-an evolutionary argument that chimpanzees developed the first egalitarian, proto-feminist society, spurred on by certain vicious hunting practices. Making the situation all the more egregious is that the targets of this style of hunt are the darling, sweet-featured bush babies, small fellow primates who look like they come out of a Keene painting. 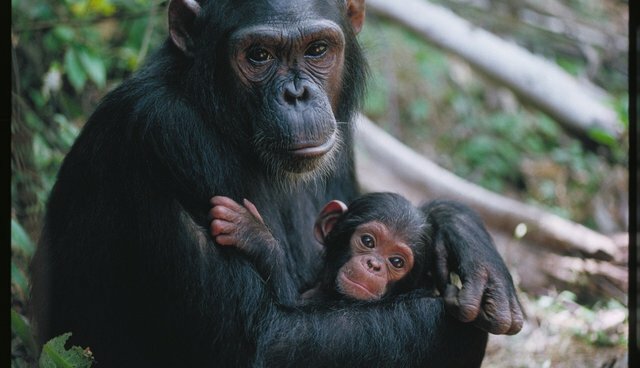 Observation of the Fongali band of chimpanzees, a group about thirty strong who live in the savannah-woodland environment in southeastern Senegal, shows that female chimps are more involved in the hunt than elsewhere. Juveniles participate, too. And the use of tools is prevalent: snapped off tree branches used to jab the bush babies out of their dens. The chimps will then grab the prey, said lead author of the study, Jill D. Pruetz of Iowa State University, and immediately "bite the head off." The big chimpanzee males who normally dominate hunting activities don't have the evolutionary advantage here. So the bush-baby killers seem to have established a more blue-state kind of vibe, with females and children well integrated into the hierarchy.